Nowadays, USB flash drives (UFD) a.k.a flashdisk to be one of the most popular storage media because of their small size, durability, large capacity, and transfer speeds are fairly high, compared to his predecesor portable storage media. However, this medium is also one of the most vulnerable media to attack the virus. One way that the UFD is not exposed to the virus is to buy a UFD that has write-protection switch. With this UFD, the virus will not be entered when write-protection switch on lock position. But to buy this UFD, we must spend more money than when we buy a regular UFD. 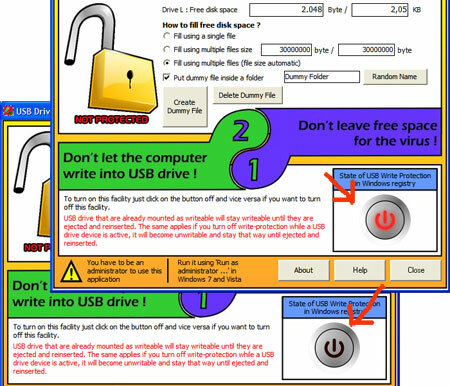 Currently has been present USB Drive Protector ++ software that can provide protection to the regular flashdisk so the flashdisk can be protected like a flashdisk that have write-protection switch. This software provides two protection at once. Unlike other software which only provides one protection, just protection using dummy file only or protection through the registry only. Dummy file created will fill up the disk free space available on the USB drive. For example, the disk free space of UFD is 37 Mb. so, the dummy file size will be 37 Mb and UFD’s disk free space will be 0 bytes. If there is no space left on the USB drive, then the virus will have no place to stay. Don’t leave free space for the virus ! One of the Windows registry value has a function to set the read and write to USB drives. This value will change to set write permission to the USB drive. If the computer can not write to a USB drive, neither can the virus. Don’t let the computer write into USB Drive ! This application working on Windows XP, Vista, and Seven. I haven’t tried it in earlier Windows version. This software is portable so as to use it quite run it without the need to be installed first. Copy this software to a UFD then execute. Click button “Create Dummy File”. Application will automatically full fill the free disk space with dummy files. Click button “Delete Dummy File”. The application will automatically search for a dummy file. If the dummy file is found, a list of dummy files will be displayed. Users can choose which files will be removed to open protection. This application combines the two functions that usually. 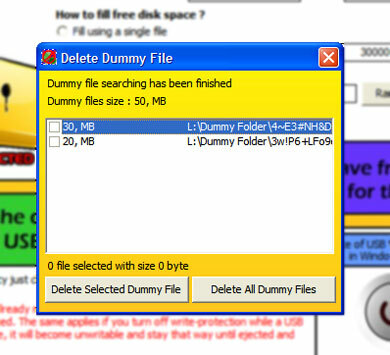 Users can adjust the dominant size of the dummy files to be created. Separate and small dummy files will also facilitate the users. If the user wants to delete protection, just remove a few dummy files so that the data you want can be copied into the USB drive. Meanwhile, if the dummy file using a large-sized files, to insert the data, a dummy file should be deleted. And if the disk free space is large enough, dummy file making should be started again when making a large dummy files require a long time. This application has feature dummy file removal, so users do not have to bother search for which is file is a dummy file. This application CAN NOT guarantee 100% virus will not infected the USB drive. It may be that someday there will be viruses that can delete the dummy files and change the registry write protect. The safest way to make a USB drive protection is to buy a USB drive that has a write protect switch. Maybe you have activated usb protection 2 . You must disable it first. Press the turn of usb write protection on the second protection. Eject the flash and then re-insert the flashdisk. WONDERFUL AND BEAUTIFULLY DESIGNED TOOL. ABOVE ALL IT’S A FREEWARE. MAY GOD RICHLY BLESS YOU AND KEEP YOU HAIL AND HEARTY. KEEP HELPING PEOPLE BRO..